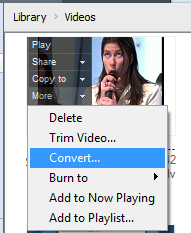 Can I convert video files to play on an iPod, Xbox, cell phone, or other device? If you have RealPlayer 18 or RealTimes, you can upload video files to your Cloud storage and then watch them on your iPhone, iPad, or Android phone or tablet using the RealTimes app, or on your Xbox One using the RealPlayer Cloud app. We do the conversion for you automatically! 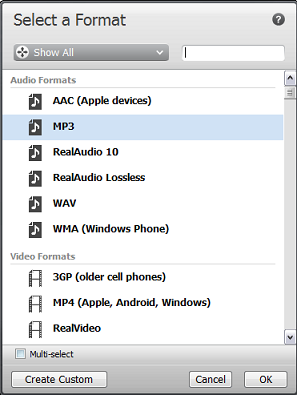 In the PC version of RealPlayer, you can also use the built-in converter to convert many files at once, convert one file into multiple formats, or save only the audio from a video file. By default, Save in is set to Same directory as original. (The converted file will have the same name and a new file extension, such as wakeup.flv and wakeup.wma.) Use the drop-down menu to choose My Music, My Videos, or to browse for another location. 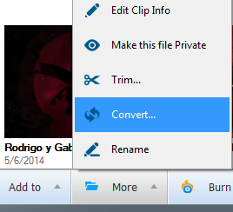 For a list of which file formats you can convert from, and convert to, please click here.